To view Financial or Techno-Commercial Tabulation/offer vendors need to search the tenders through Quick Search or Advance Search and click on the action column icons to view Financial or Techno-commercial Tabulation/offer. 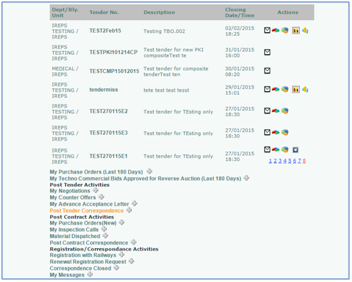 Alternatively vendors can directly go through 'My Bids for Tenders Closed' link available on vendor's home page. 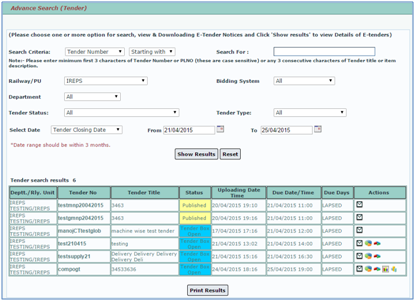 Railway users can view the Financial and Techno-commercial Tabulation for any tender of any Railway by searching the tender through Quick Search or Advance Search but Financial and Techno-commercial offers can be viewed only for those tenders which are pertaining to their own Railway. Sir, help me to tell if mistake in calculation during preparation of financial tabulation of global limited tender,what may be done regarding the concerned issue.if possible, how can be? Financial Tabulation generated by the system itself on the basis of the data submitted by vendors and parameters submitted by railway officials for global tenders. It is not possible to change or modify the data once it has been submitted to the system. If your company is eligible for exemption then have to select the 'Exempted' option for TDC as well as EMD and submit. After that you can proceed for the techno-commercial and financial biddings. Is it possible to view Financial and Techno-commercial Tabulation of any tender? I wish to know the bids of my competitors.